Like Lazarus, or maybe Frankenstein’s monster, the appalling plan for the Eisenhower Memorial in Washington, D.C., appears to be sputtering to life once more. Only two months ago it seemed safely kaput. The design by “starchitect” Frank Gehry aims for a deconstructionist fantasy that scatters its elements (massive stone blocks, a few statues, a vast metallic screen hoisted between 80-foot posts) across a chaotic city block just off the National Mall. 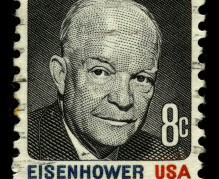 It’s a sly insult to Dwight Eisenhower and the homespun virtues he typifies in the American imagination. And coming from the famously antibourgeois Gehry, it is very likely a pitiless joke—completely missed by its targets—on the aesthetic judgment of the bureaucrats and bumpkins responsible for preserving the integrity of the city’s memorials. Having gazed upon the design—and having duly registered the opposition of Eisenhower’s family—the relevant committees in the House and Senate were properly horrified. The commission overseeing the memorial has already spent more than $60 million, without a spadeful of earth being turned. (Bureaucratic inertia can be a blessing.) It had asked for another $60 million this year in hopes of beginning construction. Instead, the House budget eliminates all funding for the project and calls for a new design competition to find a more fitting memorial. The Senate Appropriations Committee approved only $1 million to keep the Eisenhower Memorial Commission in existence for another year, with no funds for construction. So when the final two review boards approved the design earlier this summer, it seemed a meaningless gesture. “Whether or not the current design is approved by the commissions has little relevance to the prospects of congressional funding,” Representative Rob Bishop, chairman of the Committee on Natural Resources, told the New York Times. Then Bob Dole showed up. At their annual convention last month, the Veterans of Foreign Wars passed a resolution in support of funding the memorial, though it was silent about the design itself. Less impressively, Dole recruited the retired newsreader Tom Brokaw, who coined the term “the greatest generation” in a bestseller of that name, to join the commission’s advisory board. Editorials this summer in both the Washington Postand the New York Times urged Congress to fund the memorial. Dole makes weekly visits to the World War II memorial on the mall to enlist his fellow veterans to his new cause. Dole has it exactly backward. Who are memorials built for if not the generations to come? All parties agree that Eisenhower deserves a memorial. But its purpose should be to impart to the grandchildren of the greatest generation, and to the grandchildren’s grandchildren, a sense of the greatness of the man and his achievements. Gehry’s design has nothing of the timeless quality required for such a living inheritance. Indeed, in its ostentatious rejection of grandeur and greatness, the design is more about the architect than the man the architect claims to honor. This argument will sound familiar to anyone who knows the story of our civic life over the last 70 years. Though the point is seldom explicitly made, the legacy of the greatest generation is decidedly mixed. It certainly got the big things right—saving the world from unspeakable tyranny, for example. In matters of architecture, design, and public planning, however, the greatest generation was a disaster, and for this reason: It lacked the confidence to question the say-so of frauds and cynics and ideologues who called themselves experts—whether in scholarship, social sciences, architecture, or art. Think of the public abominations wrought by this careless deference to self-appointed authority. Think of the disaster of “urban renewal,” and the high-rise housing projects—vertical slums—that blighted inner cities. Think of such forbidding public spaces as City Hall Square in Boston and Pershing Square in Los Angeles, Empire State Plaza in Albany and L’Enfant Plaza in Washington; an endless parade of brutalist insults to the tastes of ordinary people. Only in the last 30 years, as the architects and planners of the greatest generation retired at last, have their successors begun to undo the damage done by their submission to modernist affectation. If we’re lucky, the Eisenhower design by the 86-year-old Gehry might come to be seen as a last gasp in his generation’s devastating experiment in ceding popular judgment to the pretensions of elites. The greatest generation could make it so. Imagine the weight it would carry if the veterans themselves took the measure of Gehry’s plainly unsuitable design, and instead of bowing to the reputation of a starchitect and his followers, insisted that their hero—and ours—be properly honored, no matter how long it takes to get it right.